Hell has no fury as a strike from this slayer sword! Many would give their soul for this slayer sword but you don't have to. 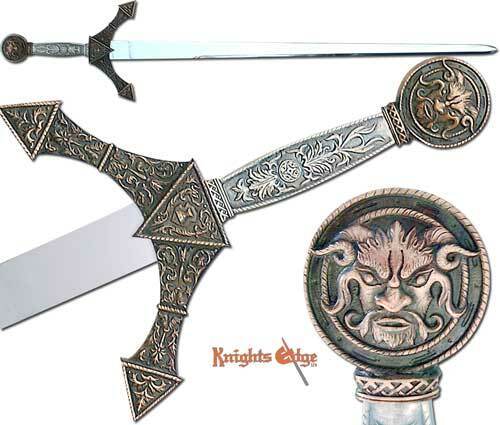 The demon slayer sword is menacing with a demon's horned head on both sides of its 2-1/2" diameter pommel and an ornate guard shaped like horns. This great sword with a 1-3/4" wide hand worked and polished 420 stainless steel blade is over 46" long. Only a sword such as this can defeat the dark side and bring us into the light! This sword is made in Toledo, Spain.